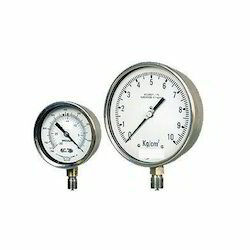 We manufacture Pressure Gauges as per requirement & specifications demanded by the clients. 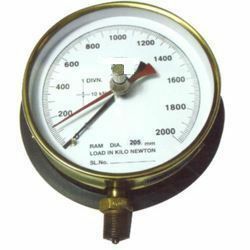 All Pressure Gauges are tested as per the Industrial Norms. Calibration Certificate is issued for the same. Four-button keypad provides access of functions including backlight, peak and valley, auto-zero, and conversion of pressure units. 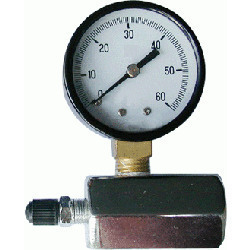 Readings may be converted from psi to KPA, inches of Hg, and Bar. Battery powered with auto shut off. Accuracy: + 2% of f.S.D. Joints: S.S. Bourdon tube tip and the socket ends are argon arc welded and phosphor bronze bourdon tubes are silver brazed / soldered. Bourdon tubes are heat-treated and stress relieved. 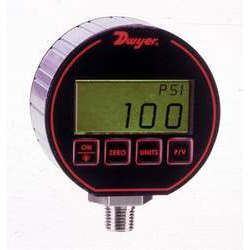 Accuracy: 1) Test gauge: +0.5% of f.s.d. 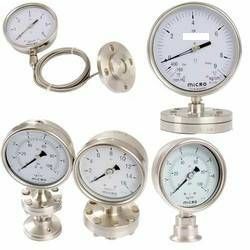 Master gauge: 10.25% of f.s.d. Master gauge : Beryllium Copper. Movement: Precision S.S.316, High Precision Jewelled Bearing with Bi-metallic link for Temprature Compensation. Pointer: Knife edged, Micrometer zero adjustable type. Case & Bezel: Die cast Aluminium Weatherproof housing, with screwed outer bezel, Stoved enamel black finish. S.S.304 snap action bayonet type. Glass: Tinted green or offwhite antislave acrylic type, Toughened or Laminated type. Case & bezel: die cast aluminium weatherproof housing, with screwed outer bezel, stoved enamel black finish. Aisi 304 ss / aisi 316 ss polished case and snap action bezel. Extra fitments: micro zero adjustment pointer neoprene blow out disc. Diaphragm material: s.s. 316 / monel / hasteloy - c / tentalum or any special material, if needed teflon sheating can be provided. Lower chamber material: s.s. 304 / s.s. 316 / monel / hasteloy - c / tentalum or any special material. Connection: threaded or flanged or flexible ss capillary can be provided. Sealing liquid:silicone oil or suitable liquid as desired by the user. dc-704, 710, fs 1265, halocarbon. Temp. limit:45° c to 250°c max. for high temp, go for cooling tower assembly - impulse tubing or capillary extension.